Water damage acts very fast. Your water damage restoration needs to be deployed rapidly too. Within one hour, furniture submerged in water can start to swell, split and stain. Within 48 hours, mold, mildew and bacteria will start to affect surfaces and fabrics. If recovery begins within 24 hours of getting wet, there is a higher possibility of restoring the affected materials, helping to mitigate your losses. Therefore, you should contact water damage restoration specialists immediately. Professional water damage restoration specialists maintain a 24-hour emergency call centre to deal with all emergencies. the availability of electricity around the premises. They should also reassure you about any concerns you might have about the water damage. The restoration specialists should be present at your premises within 1 to 2 hours of the call to conduct the initial site damage assessment. In the ideal scenario, you should call immediately upon realizing that water damage has occurred. Restoration is most effective when the assessment is done within 1 to 2 hours of the damage. This is a crucial step in creating an effective plan of action that will result in a successful restoration. Once they arrive at your premises, the restoration specialists will conduct a detailed inspection of your property. protect property from further water damage that may be continuing, etc. The first step the professionals should undertake after inspection, assessment and removing property from your premises is the efficient and rapid extraction of visible excess water from your premises. Depending on the amount of water, the equipment they use may include powerful submersible pumps and industrial-strength extractors which may be truck-mounted. This helps to reduce the drying time, reduces primary water damage and helps to prevent mold growth and secondary water damage. 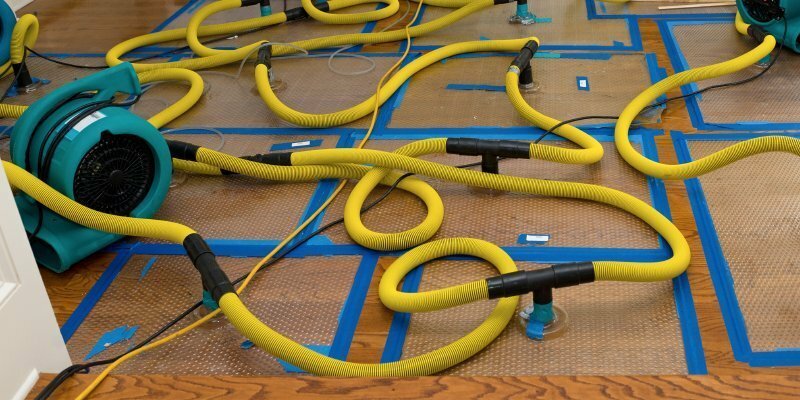 Once complete, professional water damage restoration specialists will inspect your floors to assess whether they should be restored or disposed of. Even after all visible excess water has been removed, water is still retained and remains hidden within your premises, especially within porous materials like drywall and wood and hard-to-access areas within your premises. From this point on, your water damage restoration specialists will be constantly detecting your premises for moisture and water, and constantly testing the levels of moisture in different areas of your premises to ensure the return of your premises to an acceptable level of dryness. They will use industrial-grade dryers, blowers, dehumidifiers, and manipulate temperature and relative humidity to ensure your premises are completely rid of the unwanted water and moisture. Once your premises have reached acceptable levels of dryness which are both reasonable and acceptable to you while fulfilling international restoration standards, some items may be considered too damaged for recovery or restoration. Professional water damage restoration specialists will then ensure that these items are disposed of in a safe and efficient manner. 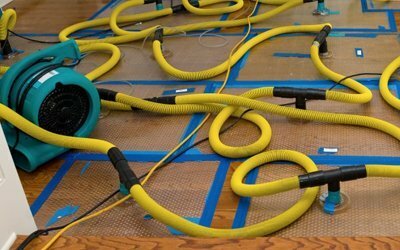 At this stage, after all the water is removed and drying and dehumidification has been successfully carried out, the floors, walls and other surfaces in your premises will be cleaned using the method best suited to the surface condition, the kind of water contamination, the extent of water damage and your needs. Water is a universal solvent and reacts with almost any material. This can be seen especially in the odors emitted off premises and property that has recently been damaged by water. These odors are serious, persistent, and cannot be removed by normal air fresheners and deodorizers. The removal of unpleasant odors is thus one of the most important priorities in water damage restoration. In many water damage cases, it is paramount to ensure the safety and good health of all occupants of affected premises. The whole premises are treated with a disinfectant to kill all pathogenic microorganisms, which include germs, bacteria, viruses, fungi, mold, allergens and other bio-contaminants. You can also opt for a special antimicrobial treatment – AEGIS Microbe Shield – which will protect all treated areas with a protective coating that kills microbes upon contact. Once the restoration experts conduct further testing and monitoring of all affected areas, repair works are undertaken to restore your premises to its pre-loss condition. Once all of the above is done, you will be ready to move in to your newly restored premises with peace of mind, knowing that the restoration specialists did a thorough and professional job. Keep this article handy or in mind should you ever have to face water-damaged premises. If you’re experiencing flood and water damage, call Big Red now. Our subject matter experts and our highly-trained technicians experienced in flood and water damage clean-up, recovery and restoration are ready to help you. Call Big Red today at 9321 9321!